Chang goes on and on about how bacon and kimchi go great together, so with a fridge full of kimchi in multiple stages of ferment, kimchi bacon fried rice was the obvious next dish in my kitchen. Crispy, smoky bits of bacon, and spicy, funky fermented bits of napa cabbage are the backbone of this quick and easy fried rice. 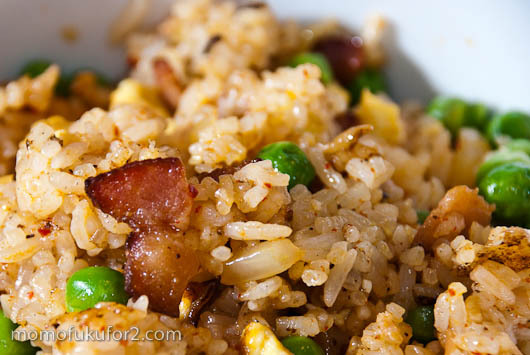 Fried rice is one of those dishes that you can customize and make your own. Really, mostly anything goes and it’s a great way to revitalize that day old rice you have sitting in your fridge. Day old rice is vital to good fried rice. If you use fresh rice you’ll end up with a wet mess; fresh grains of rice have too much water content in them for frying. I learned how to make fried rice from my mom. Growing up, I used to watch my mom make fried rice all the time: for breakfast, for lunch, for dinner, for snacks. We ate a lot of fried rice, it was economical, fast and tasty. My favourite was when my mom would make bacon and egg fried rice. My love for bacon and breakfast foods were all wrapped up in a delicious bowl of fried rice that I’d top with ketchup. According to my mom, the key to perfect fried rice is frying all your ingredients separately. She’d always start with the eggs, breaking them right into the slick, shiny black wok and mixing the yellow, yellow yolks with the whites to scramble them to almost cooked, but not quite. The eggs were scooped out and set aside to make room for the meat. You can use any kind of meat you want, after it’s cooked, move it out of the wok and heat up a good dose of oil until it’s almost smoking. 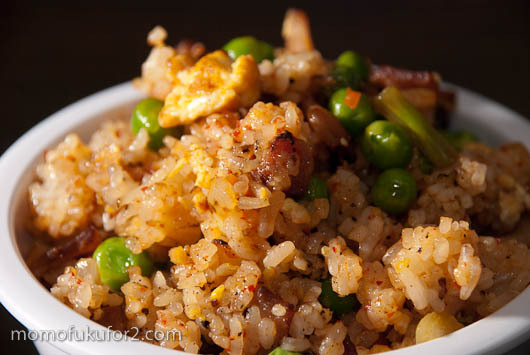 Fried rice is meant to be cooked fast and over hot hot heat. 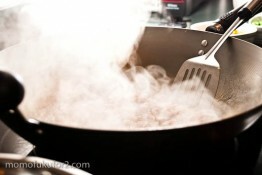 The heat of the wok imparts a flavour to the finished dish so its best to cook it hot and fast. After the rice is fried up and the clumped up bits are broken up, add your meat, eggs, any vegetables your using and seasoning. You can use soy sauce, salt, or yes, even kimchi. It may be because I haven’t had fried rice in a while, but this bacon kimchi fried rice was awesome. 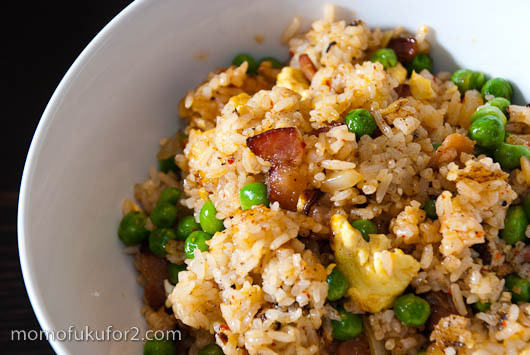 The thing I love about fried rice are the multiple perfect bites that have every ingredient of the dish. 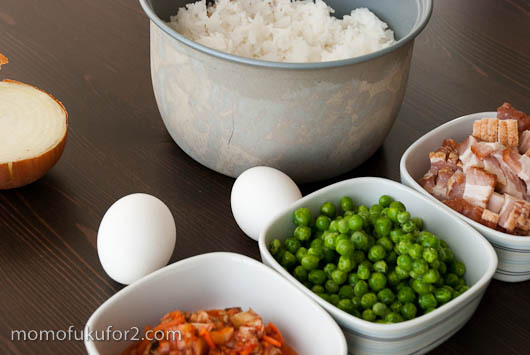 A bit of crispy rice, crunchy onion, smoky bacon, sweet peas, savoury egg, and spicy kimchi all in one perfect bite over and over and over again. 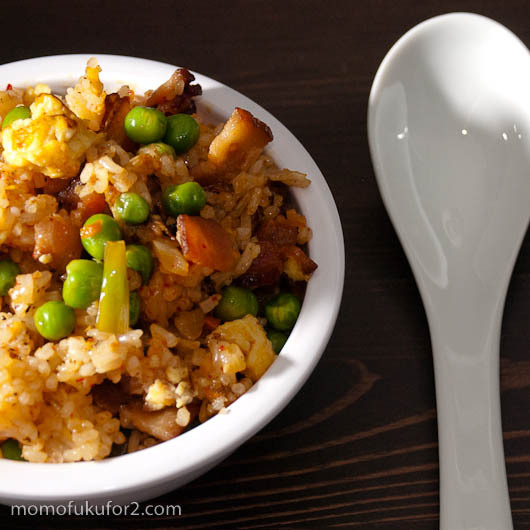 You need to make this bacon kimchi fried rice, your taste buds will thank me! 1. Heat some oil in a wok over high heat. When the oil is shimmery, add the diced onions, stirring until cooked, but not brown. Remove the onions from the wok and put in a bowl on the side. 2. There should still be ample oil in the wok, if not, add a tiny bit more and scramble your lightly beaten eggs until mostly set, but not over cooked. 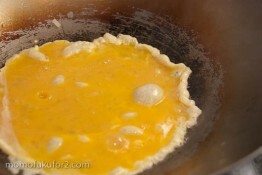 The eggs will cook a bit more when you fry all the ingredients together. Remove the eggs from the wok and add them to the bowl with the onions. 3. 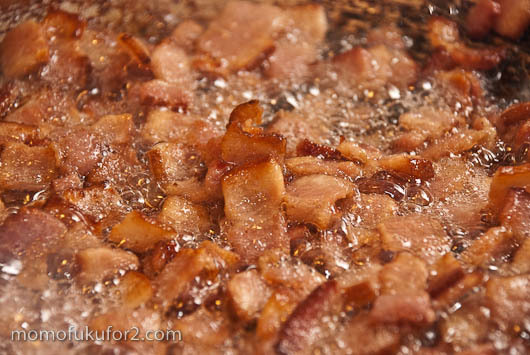 Cook the bacon until crisp. Remove and put in the bowl with the onions and eggs. 4. If you’re concerned about how much fat you consume, remove the bacon fat from the wok, otherwise, add the rice and fry it, stirring occasionally until all the clumps are broken down and the rice is heated, about five minutes. 5. 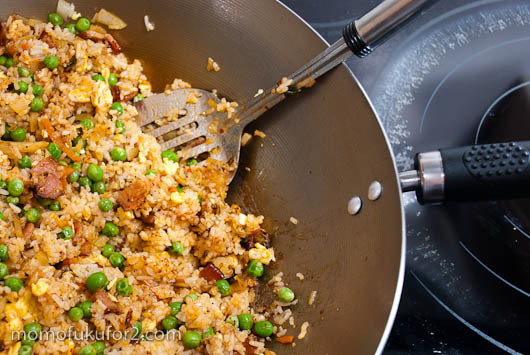 Add the onions, eggs, bacon, and peas and fry until all ingredients are mixed throughout the rice. 6. Add the chopped kimchi and kimchi liquid, mixing thoroughly. 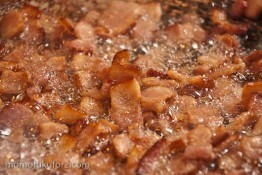 I love the picture of the bacon frying. It sounds like your mother was more relaxed about saturated fats than mine. She would reject this for that very reason. I, on the other hand, love the idea of this. Hahaha, my mom is like your mom, not relaxed about saturated fats! 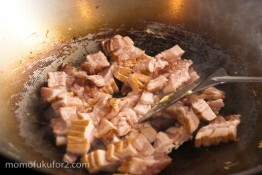 On the other hand, I like frying my rice in bacon fat. Ooh, I have to try this. I made a bacon & kimchi egg salad sandwich the other day – surprisingly good. Mmm….bacon and kimchi egg salad sounds good! That looks delicious. I’ve never made fried rice. I think I’m missing out on something really good. Looks fairly straightforward to make, too. Fried rice is super easy. Just make sure you have all of your ingredients on hand and you fry everything separately. Plus, you can make super healthy fried rice too, with veggies and tofu, if bacon doesn’t do it for you. I agree, I’m a total kimchi convert! I never used to like it, now I’m addicted! 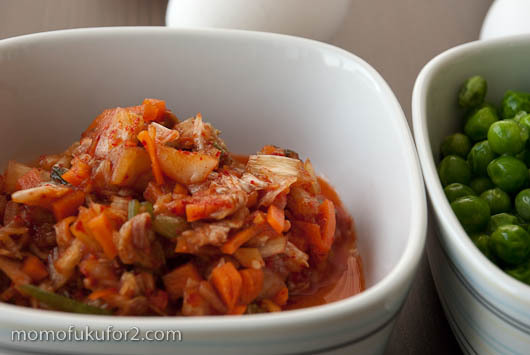 I like Korean food Kimchi~!! Thanks, it was delicious and pretty easy! Yes, finally something easy enough for me to make! Haha. Hahaha, give it a try and let me know how it goes! Might I recommend frying fried rice in lard. That’s one ingredient that always makes me get fried rice at restaurants in Taiwan. Good stuff. Hmm, sound deliciously unhealthy! Maybe I’ll try it soon. Good luck with your fried rice and let me know how it turns out! I only make Thai fried rice but def’ give it a try for this kimchi! thanks for sharing. Hope you like it just as much as Thai fried rice! I made this the other night for dinner and I have to say, it was great. Thank you for the recipe. Kimchi fried rice is great. You did a wonderful job! Thanks! I love kimchi fried rice. The flavours are so fantastic together. With our line, all of us prefer our kimchee seperate. The contrast of hot vs cold (to us) is much more awesome. Or maybe warm kimchee isn’t appealing to us. Though, it is hard to get that kim chee seasoning throughout the entire dish. 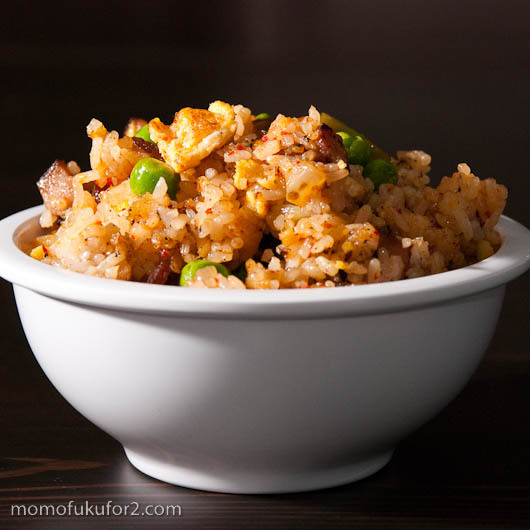 Additionally, from our childhood, we like a sunnyside egg on top of the mound of fried rice. Heehee, I guess when you grow up with food a certain way, it seems crazy to have it any other way. The kimchi fried rice tasted amazing though. Maybe next time I’ll add the kimchi juice into the rice and have cold kimchi on the side. This looks so, so good! Think I’ll cook some rice so I can make it tomorrow! Awesome! Let me know how it works out for you! I made this tonight and it was really great. Thanks so much for posting. Judging by the dates of the other comments I’m a bit late to the party but I tried this recipe on the weekend and it’s so good. I might even go as far as to say life changing because it’s so tasty!! Ha haaa, I made kimchi bokeumbop! It’s only taken me seven years in Korea to finally cook a Korean dish myself. Pretty good, passed my wife test, though she did have some pointers, told me to cook the bacon first, though she said it tasted good. Just made some kimchi fried rice. It was awesome! Thank you so much for both the recipe and the inspiration. I made this recipe last Saturday evening with some really hot, languishing kimchee. I lightly seasoned the rice with fish sauce and golden mountain sauce before cooling it to use for the recipe. I also added sliced green onions to the mix and served the fried rice with Korean BBQ chicken. Heavenly!!! Thanks so much for sharing this fab idea!